Extended Service Set Identification (ESSID): eduroam. Authentication protocol: IEEE 802.1X EAP-PEAP-MSCHAPv2. Name of the certificate of the CA: AddTrust External CA Root. Name server certificate check: radius.imdea.org. The installation and configuration of the devices used to establish a connection will depend, first, of the institution of origin that provides the user his credentials, secondly, on the type of device used to access the network (computer, tablet, mobile, ... ) and, thirdly, on the operating system of the device. Every institution allows connecting with a number of different devices and operating systems and most bear in mind the most common ones. Since technical support is the responsibility of the institution of origin, users must turn to them for information about installation (if required) and configuring the software necessary to connect (known as «supplicant»). Therefore, if a guest at IMDEA has any doubt or incidence, he/she should contact their respective institution; and IMDEA users must contact IMDEA's eduroam Care Center: caeduroam@imdea.org. Institutions that belong to eduroam are shown here: www.eduroam.org. Spanish institutions that belong to eduroam are shown here: http://www.eduroam.es/instituciones.en.php. You may also visit http://foros.eduroam.es/, which includes answers to frequently asked questions about connecting to eduroam. Having identification data issued by one of the member institutions. In IMDEA's case, the identification data is: your e-mail and your associated password. Having a device with a wireless network adapter that meets the standards 802.11b or 802.11g compatible with WPA or WPA2. Depending on the device, the adapter might be USB, PCMCIA, SD, etc. For several years now, laptops have integrated adapters. To find out if your wireless card supports WPA or WPA2 visit the manufacturer's website or this generic site WIFI Alliance. The security certificate on the eduroam network is signed by the certifying authority: AddTrust External CA Root. You may need to install this CA on some devices. If you do not have this certificate on your device, you can download it from RedIRIS at: https://www.rediris.es/scs/capath.html. When a connection to an eduroam wireless network is established outside IMDEA, the connection data will be sent securely to IMDEA for authentication. IMDEA will in return send the authorization to use of the wireless connection in the institution you are in. Windows and Macintosh laptops: you will need to istall a software to manage the connection to the wireless network providing more security and stability (installation wizard). Smartphones and tablets: you won't need to install any software, but you will have to configure the connection. All devices using Ubuntu Linux: you won't need to install any software, but you will have to configure the connection. Setting up eduroam is automatic. If you are using a laptop, you will only need to download an installer. When using other devices, simply follow the configuration instructions provided by your home institution. These steps will need to be followed just once. How to connect will vary depending on the operating system used. You can set other operating systems with the help of manuals and installation programs provided directly by participating institutions. You can find both later on this page. 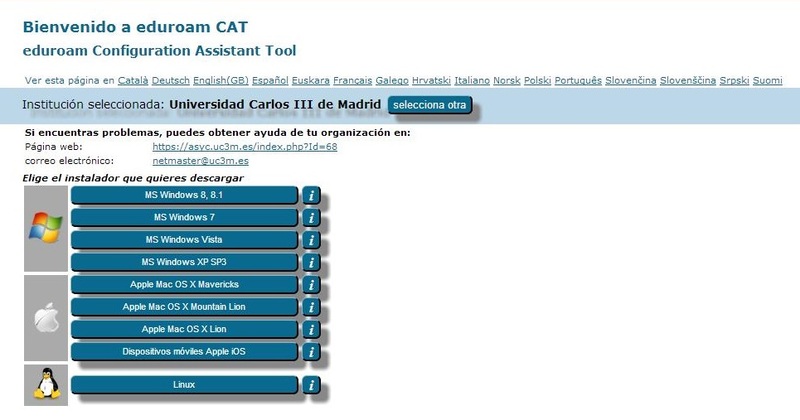 Once in eduroam CAT click on «eduroam user: download your eduroam installer». Next, choose your institution from the list of participating institutions. You must then choose the operating system of the device used to establish the connection. By clicking on the information button next to the operating system, you will view basic information about the software you need to download and its configuration. Once you click on the system's download button, an executable file (.exe) will be downloaded and saved in your browser. This is the file you will need to copy and run in your device. Installation guide for iPhone, iPad, iPod Touch. Installation guide for Snow Leopard. Ubuntu/Debian: include their own installation wizards, so you will only need to configure them. Installation guide for Ubuntu/Debian. Installation guide for Windows 2000. If you are a visitor whose home institution is participating in the eduroam project, you can stay connected during your visit to IMDEA by setting up your device as directed by your institution. Once done, simply enter your e-mail address and password, considering the authentication method used in your home institution. If your home institution is not involved in the eduroam project, you can connect to some of the IMDEA institutes using their "IMDEA Guests" service. To access this service, please contact the IMDEA Institute you are visiting.